One of the most powerful tools you have on your event planning toolbelt is the element of surprise; surprises are scientifically proven as one of the best ways to engage a crowd or audience, as “novelty enhances memory.” Who doesn’t want to attend a memorable event, am I right? With this said, we want you to have the most memorable events and feel responsible for providing you with the inspiration and tools necessary to have memorable events. Below you will find 3 wild ideas that include (SPOILER ALERT) a kabuki drop, a CO2 Blast, and a flash mob! An act of modern-day, Houdini-type magic, the Kabuki Drop was made with the disappearing act of Batman, himself, in mind. For example: have you ever seen a movie where a purple powder is thrown violently towards the ground by a dramatic movie character, stuck in a tight situation, and immediately following, a Flash! and a Bang! leaving said dramatic movie character gone without a trace? If not, I think you still get the idea. The Kabuki Drop is the real version of the disappearing powder. Still not catching my drift? The anatomy of the Kabuki Drop is perfect for concealing or revealing performers, speakers, or otherwise your main attraction by use of a lightweight fabric that is dropped from the roofing structure. To see it in action, watch the video below of BYU’s basketball team’s epic entrance. 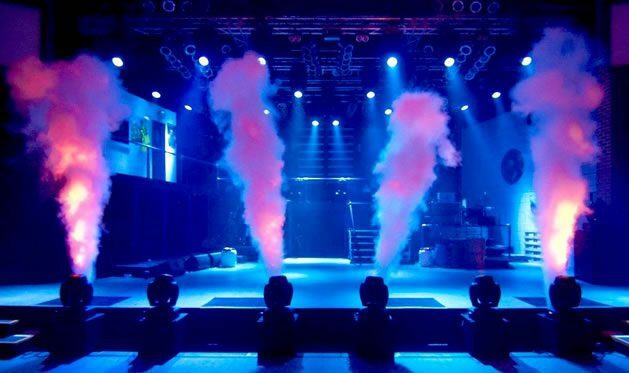 There is no better way to take your audience by surprise than with a loud and cool blast of air from a CO2 Blast! Picture this: 4 canon-like mechanisms sitting at the front of the stage, facing the audience at a 45 degree angle, and right when the attendees are least expecting it… Boom! a CO2 Blast paired with the perfect hype-song and crazy lights, sending chills from the ears to the toes. This experience is on-par to being in a 5 Chewing Gum commercial, to say the least, and will be remembered by those in attendance for years to come. Bing, bang, boom, memorable events. The notorious Flash Mob swept the nation and infiltrated the web a few years ago and it is safe to say, the flash mob is an internet sensation; the flash mob is perfect for making memorable events and has the power to highlight an attendee’s experience. A few ideas to effectively involve a flash mob at your next event is to make it a simple series of movements where a large crowd can easily catch on or send out a “how to prepare for [insert event name here] video” with the prompted movements pertaining to the event flash mob. In conclusion, we really want to be advocates of memorable events and, in turn, maximize the experience the attendees undergo to redeem the time spent by event planners planning these particular events, and we hope these ideas have inspired you to make a memorable event experience of your own. Before wrapping up this article, I would like to apologize on behalf of myself and Endless Entertainment for the website issues we have been experiencing this week, hence the inconsistent number of blogs published this particular week. It is safe to say that we are back on the workhorse with guns blazing, firing the of-highest-quality information for your event planning needs and inspiration. Thank you for being patient readers, download this free event infographic to reconcile this last week’s unfortunate events, it’s on the house. Have a great weekend!